Russian Energy Giant’s Top Manager Arrested On Spying Charges 5 out of 5 based on 4 ratings. 4 user reviews. On June 19, Moscow’s Lefortovsky Court sanctioned the arrest of Karina Tsurkan suspected of espionage, the state-run news agency TASS reported. A spokesperson for the court said that Tsurkan will be detained until at least August 13, while investigators build their case, the details of which have been classified. The spokesperson described Tsurkan as a female foreign national because it allegedly has a Moldovan citizenship. Tsurkan is accused of espionage. She may face up to 20 years behind bars. Since 2012, the suspect has served on the executive board of Russia’s energy giant “Inter RAO”. Before joining the board, Tsurkan managed the energy comnapy’s geographical divisions in Europe, Moldova, Ukraine and Romania. According to Russian newspaper Kommersant, Tsurkan is suspected of working with persons allegedly connected to Romanian intelligence. Kommersant also said that security forces had searched offices of high-ranking officials in the Russian Energy Ministry. This move is allegedly linked to the investigation into Tsurkan. Inter RAO is a Russian energy holding company involved in projects in power and heat generation, electricity supply, international energy trading, engineering, design and development of electric power infrastructure. It also controls several thermaland hydro power plants, grid operators and energy traders outside Russia. Thus, Tsurkan has had an access to a key data on the Russian energy security. Tzurcan : Romanian Intel aka automatically CIA. I don’t believe this: Romanians are too weak to deal with this kind of infiltration. This looks like high level gangstering : a very professional manager tackled by a russian idiot with friends in the Putin’s FSB. This girl doesn’t look like a Romanian spies. Let me ask – how does Romanian spies look like? Not like a women having this kind of financial interests in his own job. As you wrote on Sputnik this women has dropped it’s Moldavian nationality and took the russian one. There are too many gangsters at the Romanian political stuff to be followed like this. One can not drop his nationality – you must be talking about sitizenship. Sorry, it’s not you, but read this: https://ro.sputnik.md/analytics/20180620/19956673/sua-baga-romania-in-scandal-rusia-spionaj-karina-turcan.html. I saw it in movies ! They would never lie to us. you are not a very bright person. Romania is currently a US political proxy – they have allowed the installation of forward, and militarily offensive, US missile batteries right on the Russian border (the Pentagon public statements claim these are against Iran!). If the Romanian political elites want to play ball – then they should expect to get get served. Romania can’t defined as US proxy. Romania can’t be defined at all. Russia has not even uncovered the tip of the iceberg. Mossad through their MI6 stooges will be bringing a lot of hardship down upon Russia. Soon Russians will feel the boot of Israel. There are so many levels of Russian government and society who work for Israel, that they will bring about regime change in Russia within 5 years time. Russia has failed to sniff our who their actual enemies are. If that is the case then there can’t be any objections if the Russians continue where the Germans left off 70 odd years ago, apparently it seems to be the only solution in containing that despicable race. I think Russia is well aware of what Israel and their neocon fifth column has done in Ukarine, Magnisky Act sanctions etc.., and NATO breathing down their back. As a result of Israel’s big adventure, it is Israel and their allies that are the big losers in the Middle East. Perhaps Israel will feel the Russian boot even more, if they haven’t learned their lesson already? 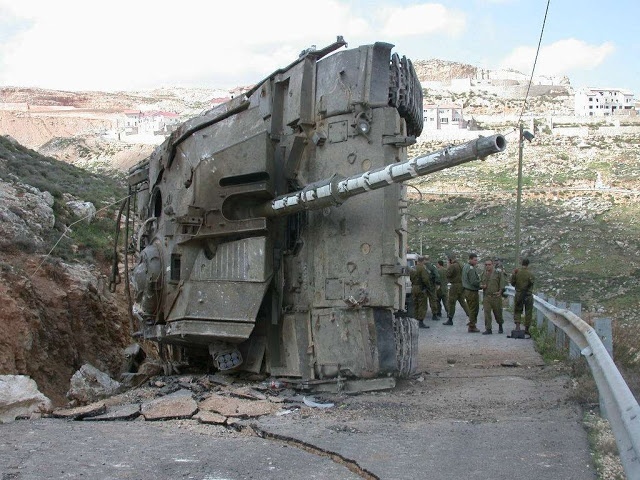 Perhaps like the IDF fools in this Merka tank that tried to mess with Hezbollah and do regime change in Lebanon back in 2006?